Water, Ice and Snow; Oh My! 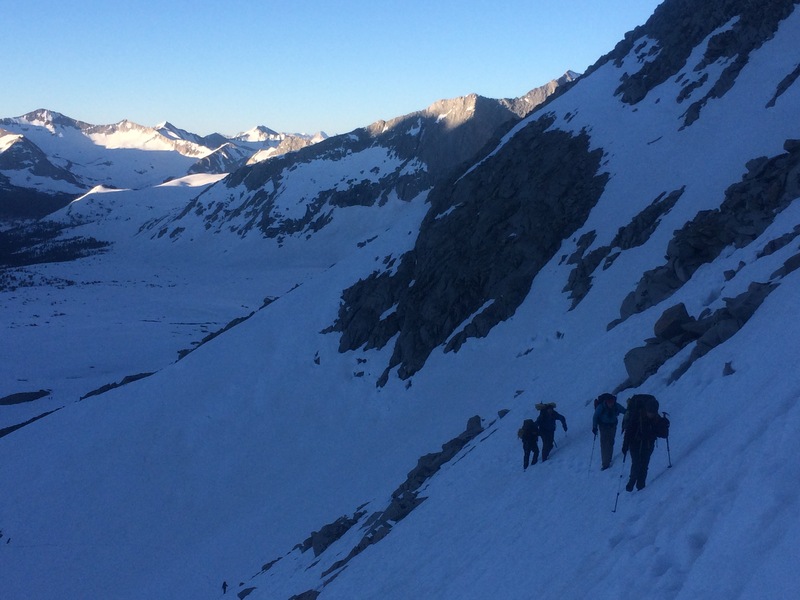 It was February when it first started; reports of the epic snowfalls hitting the Sierra and Cascade ranges begin filling my social media pages along with the subsequent warnings of what this would mean for 2017 PCT hikers (the word “impassable” was used a lot.) The amount of snow received varies depending on the area and data source, but the general consensus seems to be that this is the highest snow year for the trail since 1983. We started to look ahead at the conditions that would be facing us and decided “We’re Canadian, we got this.” With that, the planning for a high snow year on trail began. You’ll need some sort of self arrest device, be it an ice axe or whippet. Personally, we went with a whippet, which is basically a heavier trekking pole with an ice axe blade attached. Since we use the whippet in lieu of one of our trekking poles we felt that it would be more likely to be in our hand when we needed it, rather then strapped to our backpack like an ice axe. We also practiced our self arrest technique on one of the first snowy slopes we crossed, hoping to build up some muscle memory in case we ever needed to use it. Dan did successfully perform an (unplanned) self arrest on the descent of Glenn Pass when a foot hold crumbled underneath him and a fall down a steep ice wall started. Thanks to the whippet the only injuries were some cuts to his face from the ice and some heart palpitations on my part. Traction devices for your shoes are beyond necessary. We carried both microspikes and crampons, but ended up using microspikes the vast majority of the time. We used the crampons if established footholds were not available on a major ascent or descent, but likely could have gotten away with just the microspikes. Be prepared for your hourly mileage to drop. In Southern California we were consistently hiking 20-25 mile days in about 8 hours of hiking time (not including breaks,) but as soon as we hit snow we dropped to 14 – 17 mile days in about 12 hours of hiking time. Snow travel is simply much slower then regular hiking, with postholing and attempting to walk on suncups. Seriously though, if anyone has figured out a way to walk over fields of suncups without feeling like a baby deer learning to walk for the first time, please let me know. We had planned for the slower pace when organizing our food and schedules, but it was still a difficult mental shift to make. Familarize yourself with the section you are hiking and check your maps/apps regularly. In Southern California we were able to blindly follow the trail along, but here we went hours or days without catching a glimpse of the actual trail underneath all the snow. Our goal quickly shifted from staying on top of the trail, to headed in the same general direction as the trail. Know your exits, alternates, and what condition they are in before you head out. Luckily, we didn’t need to use any early exits, but we did use a lot of alternates. Start early, really early. We consistently woke up at 2:00 AM and started hiking by 3:00 AM; this allowed us to get up and over a pass each day while the snow was still frozen and crusty, which is much faster and safer then mushy snow. We then spent the afternoons in the valleys slogging through the soft snow, getting as close as we could to the next day’s pass. Sunscreen, always. Be sure to get the underside of your your nose and chin as protection from the reflections off of the snow. Use wrap around, polarized sunglasses. From Kennedy Meadows to Independence I was wearing polarized sunglasses without a wrap around fit and found that it was not enough. I ended up with swollen, red eyes, but that was quickly fixed with a new pair of sunglasses with more of a goggle fit. While we were in Kennedy Meadows we had the pleasure of meeting Yogi and her partner, a triple crown hiker himself (sidenote: if you don’t know who Yogi is, do yourself a favour and Google her; she’s a legend). He offered us the helpful advice to avoid breathing through your mouth while travelling over snow fields, as you can burn the inside of your mouth. I’m afraid I forgot this advice the first few days and wound up with an annoying burn on the roof of my mouth, much like after eating a too hot slice of pizza. Don’t feel you need to cross streams/rivers where the trail meets up with water. When we encountered any tricky water crossings, we dropped our packs and split our group up, sending half upstream and half downstream to look for a safe crossing site. Use alternates! We managed to avoid a few crossings by using alternate routes. For example, if the trail crosses the river twice, just stay on the original side of the river you started on and bushwhack until the trail returns to your side of the river. If we had a crossing with a strong current, we crossed in pairs, with the heavier individual in front, sidestepping across one at a time, facing upstream but moving in a diagonal downstream. This is Isabel. Your mom passed on your blog address. This is amazing! I can’t wait to hear more about your journey. What an awesome adventure!! !